Then we gave each FLX7 model a pad style cylinder head ready to accept one of our forged steel port fittings. Next, we engineered 5 forged-steel port fittings, each designed to fit the FLX7 cylinder head. The port fittings are not assembled to the compressor at Sanden's factory, This allows the end user to adapt a single compressor to fit a variety of applications. 4865-6340 Horizontal 3/4" x 7/8"
4866-6340 Vertical 3/4" x 7/8"
We didn't stop there. We gave the FLX7 series a wide variety of clutch rotor configurations. Finally, we gave each FLX7 compressor two clutch lead wire terminal options right out of the box for application flexibility. Utilizing interchangeable parts, the FLX7 compressor series allows distributors to consolidate hundreds of unique part numbers into less than 20. This translates into lower costs, and increased customer satisfaction. The FLX7 doesn't just replace existing models, it also creates compressor configurations previously unavailable from Sanden. The consolidation of part numbers means customers can stock fewer models and still meet customer demand. Consider this example: A distributor who previously stocked twelve different Sanden model numbers can now stock one FLX7 compressor and six port fittings. 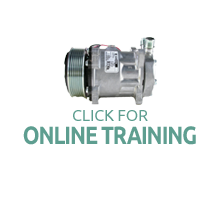 The port fittings and clutch lead wire options give customers the ability to tailor their compressor inventories to satisfy a variety of A/C system configurations which, in turn, will translate into reduced slow-moving and obsolete stock. Flexibility truly is the key benefit of this compressor series. Customers will be confident, as they experience seasonal demand, that the FLX7 compressor on their shelf can be adapted on-the-fly to satisfy a variety of applications. 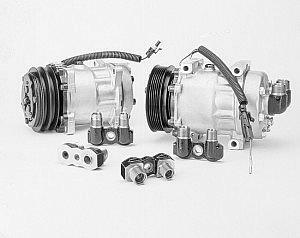 The two clutch lead wire options and six fittings are just the beginning. More options are in development. The result will be an even more adaptable and flexible FLX7 compressor series. Designing the FLX7 series to be compatible with hundreds of different A/C systems wasn't enough. We gave the FLX7 added value to make it clearly superior to other compressors. Each FLX7 comes standard with heavy duty clutch bearings, a clutch diode, and a pressure relief valve. The port fittings are also a superior value. Sanden's FLX7 port fittings are low-profile and made from forged steel, giving them superior durability and lower weight to cast-iron fittings. Sanden's customers are demanding shorter lead times for delivery of products, and we have the answer. The FLX7 can be delivered from our factory in days, not weeks. This reduced lead time means customers can stock less on their shelves and still have the ability to capture unforeseen market opportunities. Now more time can be spent taking orders instead of forecasting compressor needs.